HomeFOODA guide to wholefood dog mealsOffally good for your dog…. Okay so firstly, my sincere apologies for the really corny headline! But it takes extreme measures to compensate for the general feeling of disgust many people have at the thought of going anywhere near offal. But organ meats are a crucial part of any raw or homemade diet suitable for most dogs*, packing a powerful nutritional punch to your dog’s diet. So it’s really worth overcoming any aversion you may have to looking, smelling or touching the stuff! I also like to think that using these parts of the animal you are feeding to your dog pays greater respect to the sacrifice of its life to nourish your pet. So what is organ meat? Organs are parts of a living animal (or plant) that work together to perform one or more functions; each organ does a particular job in the body, and is made up of specific tissues. 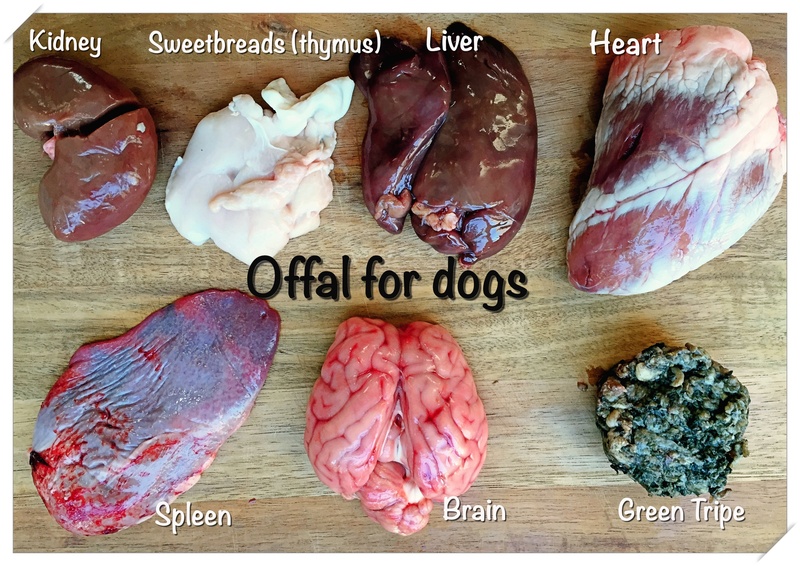 Often referred to as “offal” from your butcher’s perspective, some of the more familiar organs include liver, kidneys, heart, tongue, and brains, but there are many more organ types that you should explore to pack an extra nutrient dense punch to your dog’s diet. 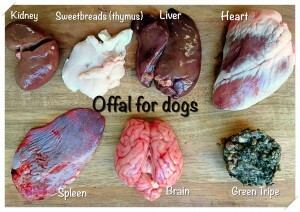 Offal is sometimes divided up into muscle-types and glandular types, each offering different nutritional benefits. Glandular-type offal are distinguished by being either internal organs or glands, are very tender to touch and highly perishable compared to other meats. 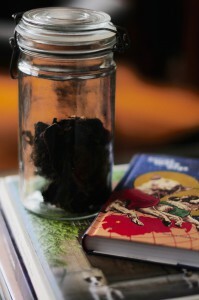 Liver: Liver has got to be one of my favourite and essential offal additions. It contains nutrients vital for metabolism such as inositol, methionine and choline and is high in Vitamin A and D. Dogs must get their Vitamin D from the diet, as unlike us, they cannot manufacture it themselves from sunlight exposure. Liver also contains the fat soluble Vitamins E and K in substantial quantities. It is an excellent source of zinc, manganese, selenium and iron as well as all the B vitamins (particularly B2, 3, 5, 6, biotin, folic acid, B12, choline and inositol). It also contains Vitamin C, quality protein and both Omega 3 and 6 essential fatty acids. Liver can be a bit rich for your dog and cause loose stools, so while it is a great addition to include regularly, a little goes a long way. Kidneys: Kidneys contain Vitamin A as well (not as much as liver) and are also a source of protein, essential fatty acids and fat soluble vitamins D, E, K. It is rich source of iron and all B vitamins as well as providing good levels of zinc. Pancreas: The pancreas is a special organ, that has a role in supporting the digestive and endocrine systems. It produces several important hormones including insulin, and on the digestive side, has enzymes that assist digestion and absorption of nutrients in the small intestine. It is rich in trace minerals including zinc and selenium and also contains omega 3 fatty acids. Great for supporting digestion. Brains: Brains are a rich source of fatty acids, supplying protein, fat and water. They have a good supply of most B vitamins (except folacin and biotin), Vitamin C and small amounts of Vitamins A and E.
Sweetbreads: Despite the name, sweetbreads are not sweet, and clearly not bread! They are typically the thymus gland or part of the pancreas. They have good levels of Vitamin B12 and Vitamin C, but should be avoided if your dog has any thyroid issues due to high levels of purines. Bull Testicles: Yep, while the men cross their legs, if your butcher sells these babies they can be a good source of zinc. Muscle-type meats are generally made of muscular tissue and are tougher than other organ-type offal. Heart: Hearts are a good source of protein and B Vitamins, as well as iron. It has some essential fatty acids and small amounts of Vitamin A. Beef heart in particular is high in taurine (essential for cats by the way), which supports heart health in animals. It is also a valuable source of Coenzyme Q10, which is important for good cardiovascular health. Tongue: Tongue also has a good source of B Vitamins and also contains zinc. It can be quite fatty though, which is great for dogs on the lean side, but use sparingly for dogs prone to weight gain or needing to lose weight. Green Tripe: Another essential in my dog’s diet. Tripe is the stomach of ruminant animals such as cows, sheep and goats. Green tripe can support your dog’s digestive health and promote a more balanced gut flora, helping to improve metabolism and boost the immune system. In addition to being another good source of essential fatty acids, it also has the perfect ratio of calcium to phosphorus of 1:1. Here’s the thing – this stuff REALLY stinks! It’s probably why most dogs love it so much. Funnily enough, I don’t find it an offensive smell (like rotting meat), it is more like milking shed aromas. I just see it as an indicator of all that fermented goodness. Sadly it can be hard to find. In Australia strict food handling regulations are making it even harder. We often see tripe at the butchers as that very white web-like stuff. There is no real nutritional value feeding it in this form as it has been bleached and depleted of its valuable digestive enzymes and probiotics. There are some dried and freeze dried options which are better than nothing, but if you get your hands on the real stuff, you’ll be doing your dog a great favour. Lung: has less nutritional density compared with other offal but is a source of phosphorus, Vitamin B3 and Vitamin C. It can help add variety to your dog’s meal. Trachea: Beef trachea is made of cartilage and as such, is a good source of chondroitin, great for supporting dogs with arthritis or joint issues. Take care though when serving to cut down the length of the trachea to break up the “rings” to prevent them getting stuck in your dog’s throat. I prefer to serve the offal raw to retain as much nutritional goodness as possible. I also like to rotate types of offal, getting us much variety as possible over the course of the week. There is a lot of debate in the raw feeding world on how much offal to feed. Traditional raw feeding practice promotes offal to average about 10% of a the total meal weight (ideally half this percentage as liver). This would be the minimum that I would recommend to avoid the risk of nutrient imbalances. More recent views in the raw feeding community suggest this could be increased by as much as 20% or even 30% of the total diet to give your dog the ultimate nutrient boost. Personally I give my dogs between 20-25% offal on average over a week, noting that this includes a really diverse range of organ types to deliver the nutritional benefits. There is little value in giving your dog 25-30% of one or two types of offal and in fact it is likely to lead to health issues and nutrient imbalances down the path. Some dogs can be fussy about organ meats particularly when raw, selectively ‘picking it out’. I’ve found grinding into the meat or very lightly steaming it can make a difference. Some people also like to get creative with their offal, stuffing parts like tracheas with minced meat and serving as a chew treat. I prefer to use human grade offal (from pasture or free range animals) as it is subject to more stringent inspections. Parasites can be an issue in some organs, but freezing the meat for a few days before serving generally kills off any of these nasties. Offal can sometimes have a more intense smell compared to other meats (especially the tripe as noted above), but discard any meat that smells ‘off’. You should also prepare and store the meats carefully as you would for your own meals, ensuring you wash your hands thoroughly after handling. While for the vast majority of dogs offal can be an essential source of vitamins and minerals, it is not suitable for all dogs. Offal is very high in ‘purines’; purines are natural compounds that break down into uric acid in the body and eliminated through the urine. Dalmatians in particular have difficulty metabolising purines, which can lead to urinary tract or kidney stones. *(Most red meats, particularly game meats are also high in purines, as are some of the small oily fish like sardines, mackeral and whitebait, and should be avoided by dogs that have problems metabolising purines). Pasternak, H (2001), Healing Pets with Nature’s Miracle Cures, Highlands Veterinary Hospital, USA.